HEBEI Qingyuan Juli Crane Machinery Co.,Ltd. Is a professional enterprise engaged in manufacturing high quality hoisting machines.Juli company lies in the tricorn area of Peking,Tianjin and Shijiazhuang City,abuts on Jingshen freeway,Jingguang railway,and it's only 150 Kilometers from Tianjin Port.All of which take great advantages to the Company. HSH series lever block is one kind of high efficiency multipurpose manual hoisting machinery, which widely applies in construction, electricity, mines, transports, installing equipment, lifting goods etc. It especially has the unique superiority when used in the narrow places, the open air and all kinds of different angles of traction. 1. HSH series lever block equipped with a "Free Brake system，which permits quick spotting of bottom hook. The double pawl braking system increases the durability of the block and convenience in operation. 2. Its high efficiency, durable and security can reduce work intention and extend service life. 3. Excellent performance, easy to operate and convenient to maintenance. 4. Small volume, light weight and portable in size. 5. High efficiency, fast lifting speed and light pulling force. 6. Advanced structure and beautiful appearance. 1. Overload, extending the handle and stamping on the handle with foot are strictly forbidden. 2. Before using, inspect the hooks upper and lower to check whether they are firm. The load should be attached on the center of the hook, the incorrect loading is strictly forbidden. 3. 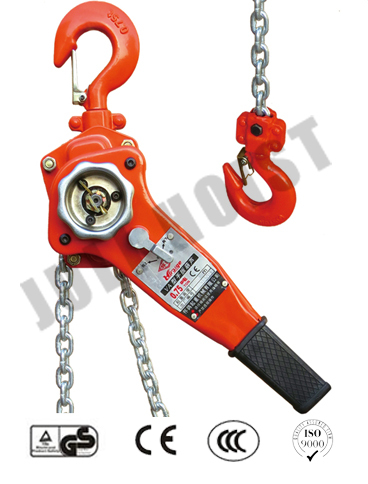 When used in tightening goods in transport, the lever hoist should be parallel to the bound items, and prevent the chain from sharp edge or comer. 4. Rough operation is strictly prohibited; don't expose the lever hoist in rainy or very humid places. 5. Its strictly prohibited to use when the chain is twisted. The hook should be replaced when the angle of top and bottom hook is above 10.